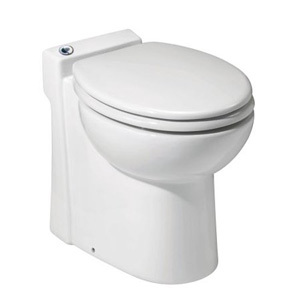 2 What Are the Main Benefits of an Upflush Toilet? 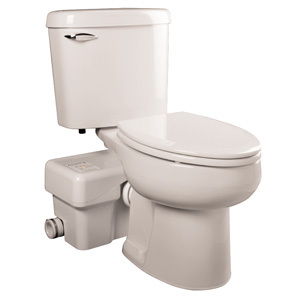 If you want to install a toilet in a location that lacks the necessary plumbing, an upflush toilet is what you need. Also known as a macerating toilet, it functions entirely different, pumping the waste upward, after a macerator breaks it down. In this way, the discharge ends up in the sewage system differently than it would with standard toilets. Nevertheless, the best macerator toilets could be difficult to find. And considering that such a unit is a considerable investment, you should not make the decision lightly. This is why we created this guide. We researched the market for the most reliable products so that the shopping process becomes easier for you. That being said; go along and read our upflush toilet reviews! We’ve also included some of the most important guidelines that are worthy of your attention! 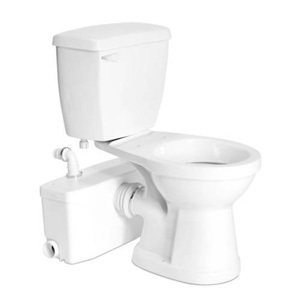 Dimensions : 12 x 21 x 9"
Dimensions : 29.8 x 20 x 32.2"
Dimensions : 31 x 17-3/4 x 28-3/4"
We consider this to be one of the top toilets for compact bathrooms, due to its specific design. That is to say, the unit doesn’t come with a water tank – meaning that it can help you save a lot of space. Plus, both the pump and the grinder are concealed under the base of the toilet. Thus, you won’t have any unsightly items in your bathroom. 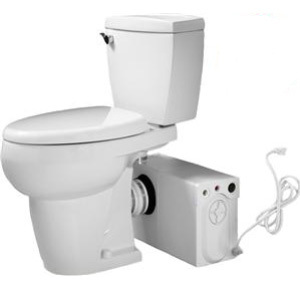 Furthermore, this self-contained toilet aims at reducing water consumption, as well. To be more specific, it uses no more than one gallon of water per flush. Considering that water consumption is an issue when it comes to preserving the environment, this is definitely a good thing. It pumps the waste vertically up to no less than 9 feet, and horizontally up to 100 feet. Nevertheless, some former customers noted that the instructions that came with the product weren’t as helpful as they should have been. This toilet kit has a sleek design, while also being highly effective. Contrary to popular belief, the installation process shouldn’t be too difficult. That is to say, as long as the instructions are followed accordingly, everything should be in order. Moving on, due to its compact construction and design, this toilet doesn’t occupy too much space. That makes it perfectly suitable for narrow spaces. In other words, if you’re on the lookout for compact toilets, this one would address your needs. Even though it is compact, this doesn’t mean that your comfort level is jeopardized in any way. Also, you should be happy to learn that this unit comes with a 2-year warranty, which offers peace of mind. Due to its reduced water consumption, we would recommend this toilet if you live in areas where the water pressure is too low. As a bonus, maintaining this is a breeze, thanks to its design. 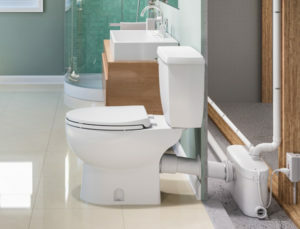 Our recommendations for the best upflush toilets continue with this particular product, also manufactured by Saniflo – which is acknowledged as a leader in the industry. This is a kit, comprising of a tank and macerating pump that efficiently break down the contents of the toilet. In fact, this is presented as a heavy-duty option. Concurrently, the high-speed macerator functions at 3600 rpm, for an optimal performance. Also, it consumes 1.6 gallons per flush. Even though this isn’t necessarily a lot, there are other units that consume less. Even if the manufacturer indicates that the unit has a quiet operation, users have mentioned the exact opposite. That is to say, this can be really loud, specifically when the pump is activated. Moving on, the installation process is pretty straightforward. As for the design, it is standard, as the toilet is easy to maintain. 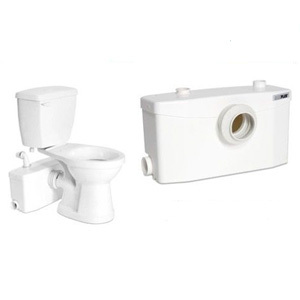 This is another toilet manufactured by Saniflo, featuring a kit with a macerating bathroom pump, a white toilet tank, and a white toilet bowl. Essentially, this kit comes with macerating blades, which feature a stainless-steel construction. This is a guarantee of their durability over the course of time. Plus, it consumes 1.6 gallons of water per flush, which is a pretty good consumption rate. Not to mention that this makes it a good choice if you live in an area where the water flow is pretty low. The pump works at 10 PSI – this being one of the reasons why this toilet is highly efficient. Considering that it weighs 99.7 pounds, transporting it from a place to another shouldn’t pose too many difficulties. What about the potential flaws of this product? Is there anything worth noting? Perhaps the fact that it comes with a standard bowl as opposed to an elongated one might be a small inconvenience to some users. This unit is acknowledged as one of the most advanced macerating toilets on the market. It comes with a set of user-friendly characteristics, such as the RazorCut Technology. Thanks to this feature, the waste is macerated accordingly right away. Note that this toilet works on batteries, which last for roughly three to three and half hours. You’ll require 1.9-volt batteries, the first batch being included with the purchase. Moving on, the bowl is elongated, which plays an important role in maximizing your comfort. At the same time, this boosts its aesthetic appeal. Concurrently, it is relatively lightweight, which facilitates ease of transportation. 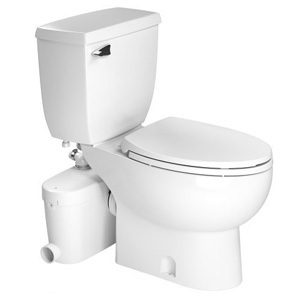 Moving on to the water consumption of this toilet, it utilizes only 1.28 gallons of water per flush. Therefore, this means you will no longer waste water. What is more, cleaning this toilet isn’t too time-consuming, thanks to its design. Also, since the service panel is removable, this provides access to servicing, without the need to disconnect the plumbing. Plus, the toilet height is ADA compliant, making this toilet suitable for people with disabilities. Another good option for a high-quality upflush toilet is the Saniflo SaniAccess 3. You will be surprised at how easy it is to install this in any bathroom. Some former customers were really pleased by this. At the same time, the shape of the bowl is meant to ensure a high comfort level for the user. 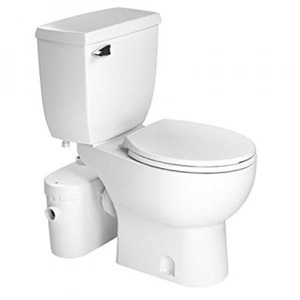 What is more, this is a toilet that maintains good hygiene, due to the powerful flush, while keeping the water consumption under control – as it uses 1.6 gallons per flush. Aside from toilet waste, the SaniAccess 3 is created to dispose of gray water from other sanitary fixtures such as showers, bathtubs, sinks, and urinals. Nevertheless, if you’re thinking of including a shower into your small bathroom, bear in mind that a base is mandatory. The waste is disposed of through two 2-inch inlets that can be located on either side of the housing. Plus, there is a non-return valve included on the discharge elbow, deterring backflow to the unit. On a different note, periodic maintenance is easily achieved thanks to the service panel. This is another kit, featuring a complete set of units. It operates on only 0.8 horsepower, which isn’t a lot. Nonetheless, this doesn’t impair its performance in any way. At the same time, its water capacity per hour is of 60 gallons. Hence, this might be a decent option for a commercial upflush toilet. Another characteristic worth mentioning is that this is ADA compliant. That is to say, the seat height is suitable for elderly citizens or disabled users. Moving on to the construction of this toilet, it is sturdy and well-made, while being aesthetically pleasing. It goes without saying that the slow-closing seat is a nice addition. Plus, the pump features a unique design characteristic – that of a 1.5 vent, whose purpose is to keep it cool during the operation. What Are the Main Benefits of an Upflush Toilet? Let’s say that you want to renovate your basement and add a bathroom there. Nevertheless, you don’t want to get all the plumbing this would require, as it would entail additional costs and other complications. However, an upflush toilet is an excellent unit, since it is mobile, flexible, and perfectly suitable for a wide range of scenarios. That is to say, you can install a macerating toilet anywhere. 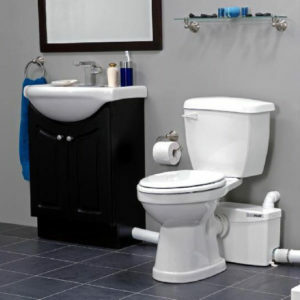 For one thing, if you are struggling with a water system with low water pressure, or you’re coping with limited water supply, a macerating toilet might be the right investment for you. That’s primarily because a macerating toilet utilizes less water since it functions differently than standard toilets. This is due to the macerating step that aims at making the waste easier to flow through the pipes. This way, it eliminates the need for water pressure. At the same time, the fact that a macerating toilet is relatively easy to install comes as another advantage. Since a macerating toilet functions differently than a standard toilet, you should assess a critical element. Let’s say that the sewer lines in your home or basement are at an elevated level. In order to ensure that the toilet functions excellently, the discharge must be flushed upwards. This is why you should ensure that the toilet you get supports maximum depth. Let’s take an example. If you want to install a macerating toilet one level below the ground level, you should get something upwards to 15 feet. Just to be on the safe side, it would be recommended to get a system that supports up to 18-feet depth. This way, not only that you’ll get the depth you need, but the added distance factor will be another advantage. Considering that the toilet’s depth of operation is of 14 or 15 feet, the distance from the ground level may be higher. Not only that the discharge must go up, but it should be capable of going across a distance before joining the sewage line. This is why you should ensure that the unit you get supports sufficient distance. Otherwise, you might end up with a toilet that is likely to clog, preventing the macerator from working efficiently. This is perhaps the reason why many people encounter problems with their macerating toilets – because they fail to consider these aspects. Whether you’re looking for corner toilets or any other type of unit, you should always consider the gallons per flush rating. This actually indicates the water consumption. Typically, 1.6 gallons per flush is a decent standard, considering that macerating toilets are more economical. That being said, the fewer gallons per flush required, the more water you’ll manage to save, which will imminently be better for the environment. Moving on, regardless of the macerating toilet you choose, you should make sure that the macerating pump is actually efficient. In order to assess this, you should have a look at the specifications of the toilet. We’re referring to aspects such as horsepower, voltage, and amperage and so on. Additionally, the construction of the macerator seals matters just as much. Stainless steel is believed to be one of the most durable materials. That being said, if the macerator blades are made of stainless steel, this comes as a guarantee that you’ll get a lot of use out of the toilet. Due to the discharge, the blades handle, it is fundamental for them to be efficient and robust. On a different note, in order to maximize the durability of the macerating toilet you get, you should embrace the right maintenance practices. We’ve already pointed that a noteworthy advantage linked to macerating toilets is that they are easy to install. Nonetheless, this would depend on your skills and experience in this domain. So, you will need a supply of water, as well as a dependable source of electricity. Depending on whether the process of installation includes the full bathroom or not, this could take a few hours to a day. If you’re an enthusiast handyman, and you have a certain degree of experience with home bathroom renovations, you should be able to do the installation yourself in no time. Toilets come in many styles and designs, allowing users to pick the option that works best for their space. That being said, macerating toilets are divided into two specific categories when it comes to design – in one-piece and two-piece toilets. Firstly, if you have a two-piece toilet, you can independently replace the tank or the bowl. Nevertheless, this isn’t a possibility with one-piece toilets, which can be a considerable inconvenience. Even so, two-piece toilets usually have less attractive designs in comparison to one-piece toilets. In terms of ease of cleaning and maintenance, one-piece toilets are preferred by many users. That’s because two-piece toilets have intricate design lines, where germs and bacteria are likely to build up. Toilet bowls can be either round or elongated. Even though elongated bowls occupy more space, they are increasingly more comfortable, because they offer a wider seating space. Nonetheless, the main advantage of round toilet bowls is that they occupy less space – which is why they are great for narrow bathrooms. As you can see, a macerating toilet can be an excellent solution for numerous scenarios. Most importantly, though, it allows you to install a toilet in a location where you don’t have a plumbing system. At the same time, even if your water supply might be weak, macerator toilets can address your specific needs, while keeping the water consumption under control. To ensure that the toilet you get is the right one for you, make sure you factor in the macerator system utilized, the gallons per flush rating, space availability, installation process, and design characteristics. Durability should also be considered, for the best results. Hopefully, our upflush toilet reviews have guided you in the right direction, so that you can make a worthwhile investment. Each of the units comes highly recommended – it’s up to you to pick the one that is most suitable for you.